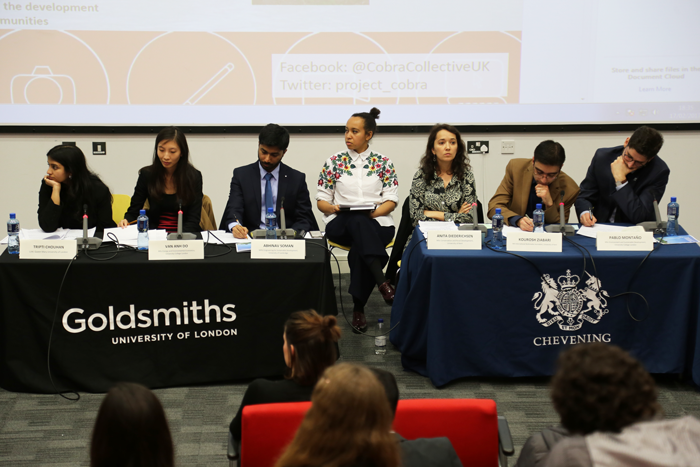 On 17 February, 2017, the year’s first Chevening debate was held at Goldsmiths, University of London. The debate was an exciting and ‘enriching experience’, in the words of one of the debaters. The event started with Kieron Broadhead, Director of Student Experience at Goldsmiths, University of London. He hosted the debate and made a short speech welcoming the debaters and the audience. This was followed by a presentation titled ‘Approaches to Environmental Governance and Management’ by Jay Mistry, Professor of Environmental Geography at Royal Holloway, University of London. In the presentation Professor Mistry talked about different approaches to understanding environmental governance and the mechanisms of managing it. The two teams were introduced, and the debate was opened by Chevening programme officer Noeme Santana. The team in favor of the motion were Pablo Montaño, University College London; Anita Diederichsen and Kourosh Ziabari, both from the University of Kent. 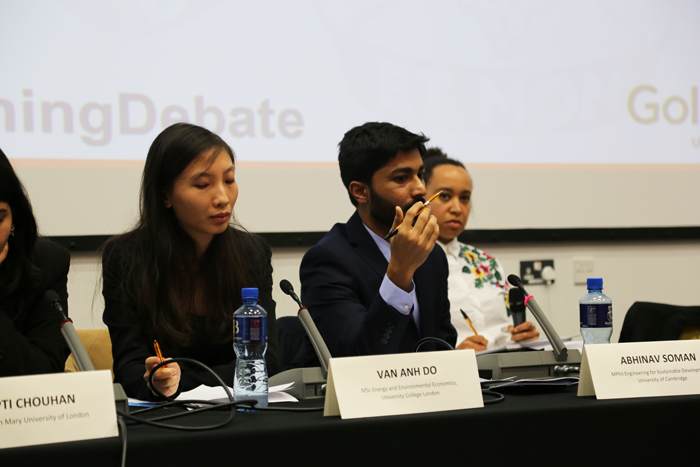 In the team against the motion was Abhinav Soman, University of Cambridge; Van Anh Do, University College London; and Tripti Chouhan, Queen Mary, University of London. The team in favour of the motion outlined their argument. This team argued that the responsibility for protecting natural environment lie with governments. To back their argument, a member of this team started with giving data indicating that climate change and global warming has accelerated unprecedentedly. They argued that 16 of the 17 warmest years have been recorded in this century and this is why the issue is urgent: ‘we cannot wait for another entity to take action’. They have also argued that the government has the capacity to push business and individuals to protect the natural environment. Furthermore, they argued that government has the responsibility to protect its citizens. Another member of this team took another more technical approach to defend their argument, arguing that there is a power relations formula between nature and society. ‘Power is embedded in this relationship between nature and society, and we need an entity to regulate this relationship’ said Pablo Montaño. The team also argued that markets are looking for profit more than to protect the environment, and this is why we cannot depend on them. The team against the motion started by stating that they are not against governmental responsibilities of protecting the natural environment, but rather they argue that everyone should be responsible, including businesses, civil society and individuals. They argued that businesses should also be responsible because industries are one of the main causes of climate change. Moreover, this team debated that individuals should also be responsible in protecting the natural environment because it’s a ‘moral obligation’. Another point they brought to defend individual responsibility is that individuals may not abide by laws and may use illegal means as it is cheaper so without awareness of individual responsibility and moral obligation, such acts by individuals cannot be stopped. This team also argued that the private sector has the means to contribute to protecting the natural environment, giving the example of how Microsoft, Google, and Amazon have decided to go 100% carbon free. Another example they gave was how some tribes had stopped deforestation when government and business had not done anything in less developed parts of the world. 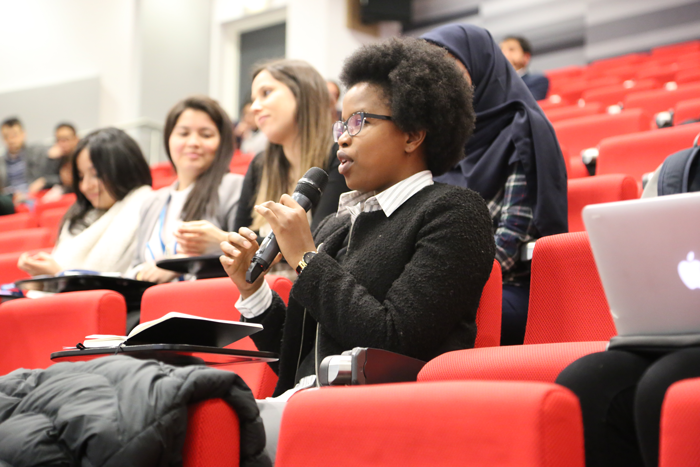 The debate finished with Q&As as the audience, who were Chevening Scholars from different universities all over the UK, actively engaged in asking tough question to both teams. At the end, members of both teams considered the debate a great opportunity. Kourosh Ziabari, one of the participants from the team in favour said: ‘Discussions and contributions from all debaters were very interesting’. Another participant in the team against the motion, Tripti Chouhan, said that she ‘learned a lot from my fellow debaters, as well as from audience’. The debate ended with an hour-long reception where the debaters and audience discussed the topic further and got the chance to get to know other scholars.